It happened again, today. One of those unanticipated reminders that I am aging and doing so in a way few would ever describe as graceful. As is so often the case at this stage in my life, this unwelcome reminder came courtesy of my children. Another family Kodak moment where wowing the kids turns into whoa-ing oneself. When I was young, my parents had a trailer at Carson’s Camp in Sauble Beach, Ontario. A modest 23’ Jayco, it made only two trips in its long, illustrious career; one up to Carson’s after my parents purchased it and another back to our their house twenty years later. In between those road trips this mighty trailer was a permanent fixture at Carson’s on our over-sized corner lot. This was poor man’s cottage ownership. Our site was magnificent. It was conveniently located immediately across from the primary playground at Carson’s and was much larger than most in this storied campground, perhaps the largest of all. It was created by a fluke boundary designation that the owner regretted for many years afterward. I guess Dad had caught him on a good day or while still in the midst of the post-coital afterglow from a surprise nooner. The playground was also large, comprising an entire campground block of the finest mid-twentieth century playing equipment surrounded by luxurious Lake Huron beach sand. Steel and simplicity was the name of the game back in those days with monkey bars, slides, and swings making do where nowadays acres of plastic and child-safe metal climbing apparatus reside. Smack dab in the middle of the playground was a small grassy knoll in which a telephone pole stood tall with a mercury vapour light at the top and a transformer that inevitably blew every August long weekend in a spectacular shower of sparks, sending our portion of the campground into the dark ages for a few hours. There were two swing sets in the playground, a small two swing baby set at the far end, and an imposing double wide metal monument to the art of swinging at the end nearest our trailer. These were the big kid swings. Standing at least fifteen feet high, though feeling twice that or more to a kid, the three a-frame structures of 3” steel tubing supported two sets of three swings for a total of six swings. The three swings on the left had the traditional drooping rubber style seat whereas the three swings on the right had old-school wooden platform seats. Those seats were special. Splinter machines, true, but oh so special. My sister and I and the other kids of the campground posse would swing on them for hours. 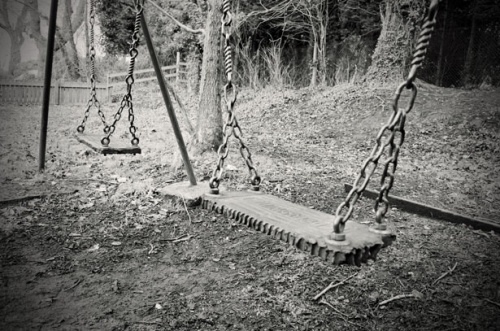 We would even stand up on those wooden platforms, pumping with our knees bent and thrusting determinedly toward the sky until we were almost even with the top bar of the swing set. It was glorious, freeing, and as close to flying as a kid could get without boarding a plane. Kids being kids, in those rosy days before class action lawsuits and parental paranoia became de rigueur, we would also engage in fearless competitions to see who could jump the furthest from the swings. This too would most often occur from a standing position as the bravest of us and those wishing to avoid taunts of cowardice, confused bravado for courage. If the release was timed perfectly on the upward arc of the swing, a twelve year old kid could easily fly a good 10 feet or more before landing in the soft sand mere inches from the grassy knoll. I’ve been back to Carson’s a couple times as an adult and those swings are long gone, replaced with a splash park. Our stately site has been reduced to a feeble, paved, short-term drive-through site. Even the grassy knoll and telephone pole have disappeared. But I can still see the ghosts of our glory days in the shimmering heatwaves of the sand, our screaming voices whispers on the hot summer breeze. This was one of the most memorable and enjoyable things I ever did as a kid. And crazy as hell, though remarkably, nobody was ever seriously hurt. I will never forget it. Nor, it seems, will I ever recreate it! Today our family of four went for a bike ride to a vintage playground in another part of our wonderful neighbourhood. It’s a very sparse playground made of steel and is no doubt a survivor from when our community was built in the early 70s. Ironically it is a playground that some local residents are currently fundraising to have replaced with a modern monstrosity claiming that the kids do not enjoy simple swings anymore. Nonetheless, my kids wanted to show this park to me having visited it with their mother the previous weekend. We quickly gravitated to the large swing set that was very much reminiscent of, albeit is smaller than, the Carson’s swings. I wanted to impress the kids with my swing skills and the kids equally wished for me to impress them, so I pumped as hard as I could getting as high as I could. For a few fleeting moments my kids were in awe of me. Their faces were flush with amazement and their voices confirmed their admiration. I was swinging higher and faster than they could themselves or could even imagine anyone doing. I was Superman. And then I had to stop. Quickly. With each pendulum swing, from my temples to the base of my abdomen, tremors of queasiness washed over my body in unyielding protest to this nostalgic activity in which I was engaging. I was now simply trying to keep lunch where it belongs. Jumping off is out of the question though memories of long ago glory passed through my mind. Well, that, and my son suggested I do so and dammit all if those delusions of superhero dad grandeur aren’t stubborn things. After all, there is no grassy knoll here. The kids would marvel at my theatrics as I sailed through the air for distances three times their height. Then they would grimace as a guesstimated 25% of my bodily bone mass, mostly in my lower extremities, shattered upon impact. Then they would turn away in horror as shards of those bones inevitably ruptured through my plump, pasty-white skin. I don’t understand why my body has forsaken my desire to swing. What is it about aging that makes this so unpleasant; so impossible? Judging by how poorly I felt for hours afterward, head aching and stomach unsettled, I can’t help but wonder how my body ever tolerated swinging in the first place, let alone loved it. What has changed so drastically that my body now views swinging as the equivalent of a Norovirus infection? Thankfully my kids were content with a single showing of my impressive high, hard swinging prowess; lack of jumping dismount notwithstanding. Or maybe they could sense that I, though gallantly trying, am just not up to this kind of thing anymore. Graceful is hard to fake. Not only is swinging harder, but people *do* forget how to ride bikes, as well. Getting older is for the birds. Thank God! I thought it was just me that had lost the stomach for swinging! Beautifully written!